At the pre-Tour team presentation, Wiggins gets Froome in a headlock, messes up his hair and declares, “I was just messing with you, mate. Everyone knows that a Giro-Tour double is impossible these days!” insisting he’s taking a backseat… but still quite fancies a podium. A team press-release states the fuss was all part of a Sky strategy to spread confusion and unsettle the team’s main rivals. While everyone’s watching Wiggins and Froome’s body language, their Australian super-domestique takes a flyer. He has a good couple of minutes’ lead and the two best climbers in the race to help him defend it. A team press-release states the fuss was all part of a Sky strategy to spread confusion and unsettle the team’s main rivals. Wiggins knows he has the edge on Froome for the first time trial and assumes leadership for the rest of the race. Froome’s scowl and furrowed brow scares local children. Brailsford tells Froome not to worry. He can have a go at winning the race next year. Tensions mount to such an extent that the team decides it can only take one of them. The excluded rider cites European Human Rights law to get out of contract and joins Omega Pharma-Quick Step in time for the Tour. A whole new war of words flares up with Mark Cavendish. Froome is worried about Wiggins’s potential in the first time trial and decides to take no chances. 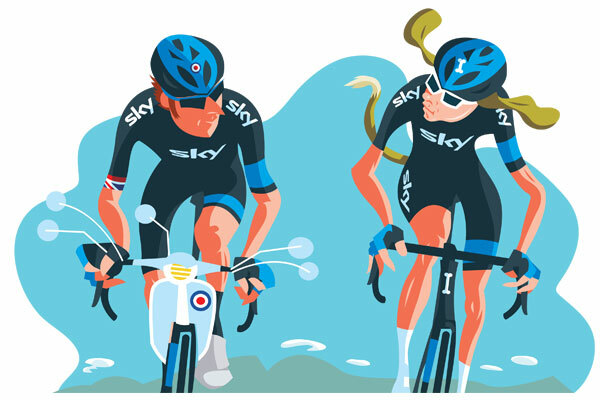 When Nibali attacks in the Pyrenees, Froome ‘follows’ the move, Wiggins sits tight and Sky sit up, bluffing the other teams. Froome rides away from Nibali and effectively wins the Tour. In the run-up to the race or a predictably hectic opening week, one of them gets ill or injured and is obliged to pull out before things get serious. Team boss Dave Brailsford breathes a sigh of relief that can be heard on other continents. Wiggins becomes the first Brit to win the Giro d’Italia, and decides “that’ll do for me, let’s celebrate”. Instead of carrying on training, he goes on a massive Italian bender with Pauls Weller and Smith. They tour Barolo and Montepulciano vineyards via Vespa museums and fashion houses, flicking a metaphorical V-sign at the Tour. This article was first published in the May 9 issue of Cycling Weekly. Read Cycling Weekly magazine on the day of release where ever you are in the world International digital edition, UK digital edition. And if you like us, rate us!